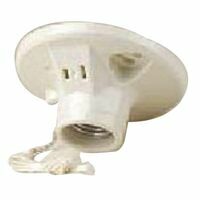 Leviton Lamp Holder, 1-Piece, Keyless, 660 W Lamp, 600 V, Incandescent/Fluorescent/CFL Lamp, Medium Base, Screw Terminal, Twist-Lock Mounting, Urea Body, Aluminum Socket, White, CSA LR-1863, UL E3810, 1-Circuit, On-Off Sequence, For Closets, Garages, Basements, Utility Rooms and Attics Leviton Lamp Holder, 1-Piece, Keyless, Top Wired, 660 W Lamp, 250 V, Incandescent/Fluorescent/CFL Lamp, Medium Base, 6 in Pigtail Lead Terminal, Twist-Lock Mounting, Glazed Porcelain Body, Aluminum Socket, White, 4-1/2 in Overall Diameter, Includes: (2) Screws, CSA LR-1863, UL E3810, For High-Intensity Lamps Molded of high-temperature, thermoset plastic. Mounts on 4" outlet boxes with breakout for 3.25" box mounting. 4 top wire screws. Terminal screws backed out. Meets all UL 496 requirements. 250 volt, 660 watts. Porcelain. Mounts on 4" outlet boxes with breakout for 3-1/4" box mounting. One piece with feed through. Terminal screws backed out for wiring without removing the interior. UL 496 Listed, NOM Certified, meets CSA requirements. 250 volt, 660 watts. Made of UV and heat resistant thermoset material (Urea). Nickel-plated brass screw shell. 250 volts/660 watts maximum. Includes corrosion resistant steel hardware. cULus Listed. Two piece hanger bar for 24" maximum joist spacing. Made of steel with a galvanized finish. Teddico/BWF Glass Globe, Round Shape, Suitable For Use With: P-3 Fixture, Powder Coated, Clear, 5 in Top Diameter, For Garden Lighting Leviton Lamp Holder, 1-Piece, Keyless, Top Wired, 660 W Lamp, 250 V, Incandescent/Fluorescent/CFL Lamp, Medium Base, Screw Terminal, Twist-Lock Mounting, Glazed Porcelain Body, Aluminum Socket, White, 4-1/2 in Overall Diameter, Includes: 2 in Pull Chain, 3 ft Pull Cord With Bell End, CSA LR-1863, UL E3810, For High-Intensity Lamps With 15 amp 125 volt AC outlet. High-strength insulator porcelain. Mounts on 4" outlet boxes with breakout for 3-1/4" box mounting. Pull chain socket interior is removable. 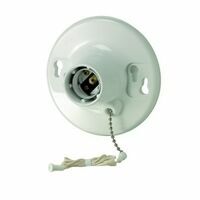 Includes ball chain, 3' of cord, connector and end bell. Terminal screws are backed out ready for wiring without removing the interior. Dust ring protects against plaster and dirt. UL 496 Listed, NOM Certified, meets CSA requirements. 15 amps, 125 volt, 660 watts. For joining two sections end-to-end. 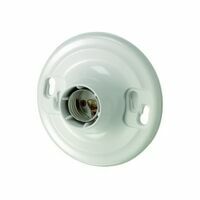 Feit Electric Night Light, Modern, Round, Series: Eternalite, 120 V, 2 W, LED Lamp, 2 W Lamp, Automatic Sensor, 100000 hr Average Life, 2.1 in Diameter, 2-1/2 in Overall Length, Plastic, White, UL Listed, For Indoor Applications Halo E-series tapered metal baffle w/white trim, 2 included, wide and narrow. 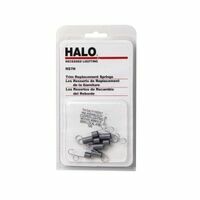 For use with E7RICAT and E7ICAT as well as Halo H7 series. UL Listed. 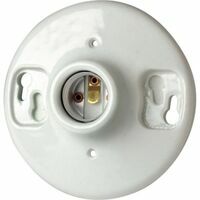 Leviton Lamp Holder, 1-Piece, Side Wired, 660 W Lamp, 125 V, 15 A, Incandescent/Fluorescent/CFL Lamp, Medium Base, Screw Terminal, Twist-Lock Mounting, Glazed Porcelain Body, Aluminum Socket, White, Includes: 2 in Pull Chain, 3 ft Pull Cord With Bell End, CSA LR-1863, UL E3810, 2-Pole, 2-Wire, For High-Intensity Lamps Diameter of 7", white trim with baffle for use with 6" Non-IC/IC housings. Easy to install. Takes 1 medium base bulb, (not included). cULus Listed. 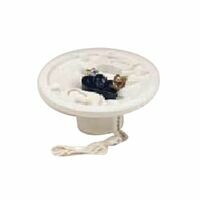 Diameter of 7", white trim with baffle for use with 6" Non-IC/IC housings. Easy to install. Takes 1 medium base bulb, (not included). cULus Listed.